The Indian Air Force on Monday said that they have "irrefutable evidence" to prove that F-16 was used by Pakistan Air Force on February 27 during aerial combat. The response comes days after US magazine reported that the count of the F-16s with Pakistan has found that none of them are "missing" and all the fighter planes were "present and accounted for". Read more. Dismissing concerns around how the Congress would fund its NYAY scheme, senior party leader P Chidambaram on Monday said the scheme would cost less than 1 per cent of India’s GDP and if the country cannot set apart even that much for the poorest 20 per cent, then it is ruled by “heartless people”. Read more. 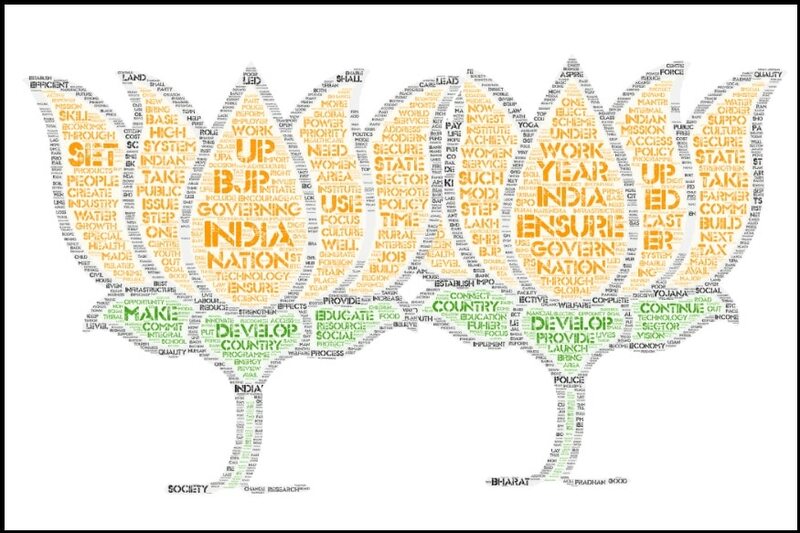 Even as experts parse through the manifesto of the Bharatiya Janata Party to identify its focus areas heading into the Lok Sabha elections, we gave it a little tech twist to crunch the 45-page document and bring to you the words used most by the saffron party in it. Hint: the word 'ensured' was the most used while 'nation' went down a few notches. Read more. Former chief of Yogi Adityanath’s outfit Hindu Yuva Vahini and his erstwhile aide, Sunil Singh is geared up to face the BJP in the upcoming polls. Singh will be contesting from Yogi’s turf Gorakhpur with support from various Hindu groups. Read more. BSP supremo Mayawati has claimed her joint rally with SP president Akhilesh Yadav and RLD chief Ajit Singh in Deoband on Sunday had rattled the BJP leadership. Meanwhile, the reunion of BSP and SP leaders after 26 years defined Gathbandhan's Deoband rally today. Read more. As a student of post-graduation, Kavita Singh appeared for an unusual interview, not for a job but to get married to a muscleman and ultimately secure the ticket to a Bihar Assembly bypoll. Read more on the tough contest between the wives of two rival goons, Singh and her opponent Hena Shahab. BJP parliamentarian Varun Gandhi's has dues of Rs 38,616 against his Pilibhit office telephone number. The state-owned telecommunications Bharat Sanchar Nigam Limited (BSNL) has written a letter in this regard to district election officer, informing them that despite "repeated reminders" the bill is yet to be paid. Read all stories related to 2019 Lok Sabha election with News18.com's LIVE election tracker. Priyanka Gandhi Vadra's performance in Uttar Pradesh has essentially shown that though number-crunching and domain expertise is essential in drawing up policies, it cannot and does not compensate for sound political judgment. In proposing and propagating the NYAY scheme, Priyanka demonstrated that she has the right instincts and political understanding of the ground situation, which are often beyond the realm of experts. Anita Katyal writes how Priyanka took a leaf out of Sonia Gandhi's book to give shape to NYAY. Read more. The BJP released its election manifesto, 'Sankalp Patra, today at the party headquarters. To celebrate the 75 years of independence, the BJP has made 75 promises and aims to make India a developed nation by 20147, marking the 100 years of independence. Here's all you need to know about it.